Britain's railways come in for a lot of criticism. The privatized, franchise-based system is absurd and has created two decades of fare increases and headaches for all parties (except shareholders that is). High-Speed 2 is on track to be overly complicated, expensive and obsolete by the time it is completed generations from now. Putting the cost of tickets aside (Britain has one of the - if not the - most expensive networks in Europe), the tickets themselves are impossibly complicated. Even the government struggles to understand the system. However, in all the chaos devised by the (sadistic) ticket powers-that-be, there are a few gems. One of these is the rover ticket. Rarely advertised, rover tickets allow you unlimited travel within specific regions within a specific period of time. 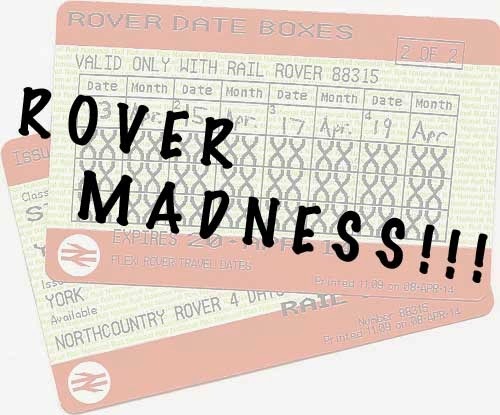 Not satisfied to leave the system that simple, there are a whole pile of restrictions, but rover tickets are normally more flexible than any others on the network. For my rail holiday this year, I decided to see how useful a rover ticket really was. Based in York, I decided to buy a North Country 4-in-8 Day Rover, which covers the vast majority of the north of England and, like its name suggests, allows you unlimited travel (after 8:45 am, except on weekends when there are no time restrictions AND as long as you steer clear of Hull Trains and Grand Central Trains AND as long as you stand on your head whenever asked to - OK, that bit's not true) on your choice of any four days in an eight-day period. Roughly speaking, the ticket covers the routes bordered by the Cumbrian Coast Line, the Preston-Bradford line, the Hull, Scarborough and Whitby lines and the Carlisle-Newcastle Line. (See the map for details). You will note that Manchester is conspicuously absent from the list. This eliminates the fastest trans-Pennine route and requires a more careful reading of timetables, which is all part of the fun. Even without a railcard, this ticket only costs £88. With my ticket bought, it was time to plan four days of rail-based rover madness. I have a confession to make. Until this trip, I had never been to Crewe, the railway Mecca of trainspotters around the UK. If you look at the rover map, you will see that Crewe is too far south to be part of the plan, so I had to cheat. Boarding a Sunday morning York-Blackpool North train, I rolled through the former textile and manufacturing hubs of Bradford and Halifax before alighting at Preston. I had bought a separate Preston-Crewe return ticket, but this was the only additional travel expense during my rover madness. At Preston, I had some time to wander around the city and admire the bus station, the largest in Britain, and the pedestrianized downtown (I expect few people admire the bus station, but it is actually quite nice). Preston's railway station is itself one of the prettiest on the network and Virgin Trains' choice of red and white really complements the stonework. Using my other ticket, I travelled south to Crewe, where I visited the Crewe Heritage Centre. Situated just to the north of Crewe station, the Heritage Centre has no direct access and required a 20-minute detour through the street of Crewe to reach. Buried behind the Tesco parking lot, the Centre features displays of photos, ongoing rolling stock restoration, three signal boxes (one of which is operated according to an accurate 1960s timetable, bells and all), an excellent viewing platform overlooking the West Coast Main Line and the only InterCity APT in preservation. The APT was British Rail's attempt at truly high-speed trains. While the InterCity 125 was a hit, it could not keep up with French and Japanese offerings. The Advanced Passenger Train was ahead of its time, complete with tilting mechanism to enable faster speeds on conventional track curves. After only a few years, the train was withdrawn. More than a generation later, tilting technology would finally return to the network in the form of the Alstom-built Pendolinos, which now pass the APT on the main line every day. The Centre is also home to the NMRA's Calder Valley group, one of the American organizations's British chapters. Watching a Vermont Railway wood chip train run on their layout made me a little homesick, as did the giant cut-out Mountie on the wall. My visit complete, I took the circuitous route back to the station. I don't normally get excited about travelling on a specific type of train (normally, if it isn't a Pacer unit I am happy), but my return trip to Preston was aboard a Virgin Trains Pendolino. I had never been on one before and I was very impressed. Smooth, fast, quiet and with decor obviously inspired by aircraft, the Pendolino feels modern. I think the tilting mechanism was in use and I didn't notice the usual swing out in a curve I normally associate with rail travel at speed. My Pendolino experience complete, I retraced my steps back to York, arriving just over 12 hours after I had left that morning. This day wasn't really about trains at all. It is important to nurture multiple interests, and I was curious to learn more about rural English life. Setting off from York again, I took the train along the very scenic line to Malton - a true market town. Every Tuesday and Friday, farmers gather for the Malton Livestock Auction. I had never seen a livestock auction before, but I felt that I should better understand where food actually comes from. This particular Tuesday was the Easter sale and featured both cattle and sheep. Most of the morning was taken up by trailer after trailer of stock being unloaded, registered and put in holding pens awaiting the sale. First up was the cattle, who are sold in a ring in a large barn. I was very surprised with how quickly I was able to pick up the fast-talking auctioneer. Essentially, cattle are sold by pence-per-kilo; all the fast-talking is really just pushing up the price, with most cows selling for between 150-200 pence per kilo. After lunch, the sheep were sold right in the holding pens, with the auctioneers precariously perched above them. Unlike cattle, sheep are sold by the batch. Assured that food really does come from the farm, I set off to the station to catch a train to Scarborough. In many ways, Scarborough is the east coast's Blackpool. A true seaside resort, Scarborough is full of touristy stuff: food, seagulls, flashing lights, casinos and gambling houses, a beach, a lifeboat and lots of rather sad-looking locals. I don't normally like 'mass' entertainment, it is too hectic for me, but I wandered through the crowds and found some peace in the working harbour (Scarborough still has a fishing fleet) and then along the spa end of the beach. Feeling I had seen enough, I headed back to York for supper - beef. The Settle-Carlisle Railway is one of my favourite railway journeys in the world. Travelling through miles of tunnels, dales and generally empty countryside, the line is a truly special part of Britain's railway network. I had travelled the line in 2002 and again in 2013, but I had never actually explored the countryside along the line. Where better to begin than the iconic Ribblehead Viaduct? After a quick train to Leeds, I got on the train for Carlisle, which sadly only runs every two hours. In many ways, we are lucky to have the line at all. During the 1980s, the line was slated for closure, but was saved thanks to a grassroots campaign which boosted ridership and made the route viable again. This year marks 25 years since it was saved. Before reaching the Settle-Carlise route, the train runs through suburban Leeds-Bradford, including the model community of Saltaire. After Settle, the line begins winding its way through the Yorkshire Dales and I got off at Ribblehead station to begin my exploration. Weather along the line is very dynamic and I was greeted with rain, strong winds and cold temperatures. While I had packed and dressed accordingly, my time at Ribblebead was bleak and made photography a challenge, with many images featuring the tell-tale blurs of raindrops on the lens. Having looked at the viaduct, which is a 440-yard marvel built into marshy ground, I walked north beside the line to Blea(k) Moor signal box, one of the most remote in England and one which is still in use. When people were naming the Moor all those years ago, they obviously forgot to add the "k" at the end, so I have corrected their mistake. From there, I continued north to Blea(k) Moor Tunnel, the longest on the line at over 2,600 yards. Along the way, I stopped for photos and to commune with sheep and, more specifically, this year's lambs, who are the most curious, playful and adorable creatures known to man. In fact, my entire week was dotted by flocks of lambs scurrying from beside the line as my trains rolled by. From the south portal of the tunnel, I started to climb to the left, only to learn that every time you crest a hill, another higher one appears in front of you. I finally gave up, cold and tired, when I reached the clouds. The wind was incessant and the sporadic rain was making the day somewhat arduous. In many ways, going down was much harder as any misstep would have meant a nasty fall for a tired climber. Somehow, I safely retraced my route, reaching the viaduct again just as a weak sun broke through. Having traipsed around in the marsh for a while, I came to appreciate just how incredible this railway line really is. Much of the land is covered in a thick, springy moss, which can easily sink inches into water when you step on it. Once the route was surveyed, the first construction task was securing dry and stable land, which must have been incredibly hard work, especially if the weather was like my unfortunately-chosen day. I returned to the station, where I marvelled at a group of hyperactive young children, full of energy after a day's hike - incredible. Having taken a train back to Leeds, I started to get creative with the rover ticket. Since you aren't locked into a specific journey, you can choose whichever train you like. Naturally, I had planned out a full itinerary for the four days, but now I felt confident enough to deviate from the plan. Ditching my original First TransPennine Express train to York, I opted instead for a Northern Rail stopping service on the same route. The result? A full FOUR minutes earlier into York. Not much of a time saving, but it got me out of Leeds station more quickly. Leeds Station has been fully renovated in recent years, but remains incredibly dark and uninviting. With cobwebs thoroughly blown out of my mind (and the rest of me for that matter) after a day on the hills, I headed home. This was my most ambitious trip, the most likely to go wrong and, in a sense, it did. My first encounter with the British rail network was in the spring of 2002, during the Railtrack fiasco which was bringing trains to a standstill and when 120+ minute delays were the norm. Unfazed, I waxed lyrical about the system which, compared to Canada, was leagues ahead. Since then, punctuality and the British network have both improved, perhaps lulling me into a false sense of security. When planning my trips, I always tried to leave about 30 minutes for connections. Not only does this allow more time for photos at stations, but is also meant padding in case something was running late. My ambitious plan was to get photos of the Cumbrian Coast line, a marvel of engineering running from Carlisle to Barrow-in-Furness. In many places, only a narrow sea wall separates cliff-hugging trains from the Irish Sea and winter storms routinely cause the line to be closed for repairs. I had carefully planned photo locations and had settled on Parton and Whitehaven having the best views. Needing all the time I could get, I left this trip for Saturday so that I could leave as early as possible. Awake and up at 4:30, I was at York Station bright and early for the 6:33 train to Newcastle. A quick glance at the departure board and I was waiting on platform 5B. A more detailed glance showed that the train was late - expected 7:00, then 7:07, then 7:11, then 7:24. My connection at Newcastle was about to evaporate. Hunting down printed timetables, I found that the 7:06 Transpennine Express train would get me to Newcastle with about 5 minutes to make my connection. With that, I made my first change of the morning. Beside me on my revised trip to Newcastle were two Network Rail employees eagerly following the progress of the late-running 6:33, which was trying to make up time behind us. There had been some sort of catastrophic meltdown involving either the track or signals, but my new train was on time, even if I was 33 minutes later than I wanted to be. I wasn't panicking, but I was heading that way. After crossing the Tyne, we arrived at Newcastle at 8:20. Shooting out of the train, I bounded across the footbridge and just made the 8:24 to Carlisle. Relaxing just as I sat down, my originally planned train, the delayed 6:33, pulled into Newcastle 10 seconds after my Carlisle train left. I had beaten the system. The Newcastle-Carlisle route is another beautiful journey, winding for much of the way alongside the Tyne (a rural, idyllic, non-industrial river this far upstream). It was a gorgeous, sunny morning as we rolled through the Northumbrian scenery. We arrived at a quiet Carlisle Station (Glasgow trains were replaced by buses) and I changed for the Cumbrian Coast train. Service on the Cumbrian Coast line is sporadic. While normally one train an hour, Sundays see much of the route devoid of service entirely. That is not to say that the train isn't popular. On the contrary, it is exceedingly popular and most trains I saw on my journey along the line were standing-room only. The route from Carlisle passes through more farmland, complete with lambs, but really becomes interesting at Maryport, where the line joins the coast. This was my introduction to something I had never seen before: post-industrial seascapes. Unlike the pastoral idyll of the Lake District, the Cumbrian Coast has long been an industrial space, first with fishing, then ship-building and now unemployment. Along the coast, we passed countless derelict buildings, ruins, miles of fencing protecting piles of concrete rubble. As beautiful as the coastal stretches of the route are, they can't hide the industrial decline or the fact that Sellafield is just down the line. The line was also my first experience of a request stop. I asked to get off at Parton, a sleepy town only separated from the Irish Sea by the railway. I sat on the rocky coast eating lunch and watching the onshore and offshore wind farms taking advantage of the incessant sea breeze. With so few trains, I had plenty of time to scout for locations. Other than wander around, there wasn't much to do in Parton. Even the village shop appeared to have closed down. I spent much of the afternoon moving from one photo angle to another, climbing up the cliffs and marvelling at the tiny trains dwarfed by both land and sea. I then started to walk along the cycle path to Whitehaven, a route which follows the railway line the entire 2-miles between the towns. Whitehaven is as depressed as Parton is quiet. It is a place where you can buy a 3-bedroom semi for under £90,000. While the former maritime hub has tried to rebrand as a retirement community, it hasn't worked. Many buildings are for sale, crumbling or both. While the town centre is looking bright, all around it is blight. The centre of activity appeared to be the Tesco, a giant modern complex next to the railway station. Outside, groups of teenagers hung around, looking about as excited as one could be by sitting outside a supermarket. I got the feeling that it was a rough place and that the industrial decline from nearby Barrow-in-Furness was felt here quite strongly. Whitehaven is the only place I have ever seen trespassers on the railway in the UK - a group of hoodies climbing over a fence to walk along the coastal route. I had had enough of Whitehaven and opted to catch an earlier train back to Carlisle. The return along the coast was just as enjoyable as exploring the coastal paths had been. Now that I had seen the line from above, I could see just how close to the water we really were. North of Parton, another first: a group of teenagers throwing rocks at the train. I had seen this in Canada, but never before in the UK. It is naive of me to think that the 2,800-strong British Transport Police are just there to stand at stations. In fact, a BTP officer joined our train before Carlisle as the Saturday night crowd was starting to appear. On the trip from Whitehaven to Carlisle, I was thinking to myself how nice the weather was and how I might stretch my luck and try the Settle-Carlisle line instead of going back via Newcastle as planned. I dismissed the notion as I got off the train in Carlisle at 17:20. The departure board caught my eye, the first train was the (extremely late) 15:47 to Leeds (via the Settle-Carlisle) which was due to leave at 17:25. Fate had intervened and I made a sprint over the bridge to catch it with only seconds to spare. According to my fellow passengers, a combination of an earlier brake failure and the need for a relief train had caused the delay. The poor conductor spent most of the trip handing out compensation forms so that people could claim for the delay. I refused one, explaining that the delay had in fact allowed me to catch the train. These sorts of impulsive changes to itineraries are only really possible with such gems as rover tickets. Instead of retracing my steps via Newcastle (and facing a Saturday night at Newcastle and on the East Coast Main Line), I was sitting at a table, eating dinner (oh, the glamour of hours-old homemade sandwiches), watching the gorgeous Settle-Carlisle countryside pass me by in warm evening light. The delay was having repercussions all along the route and crowds of confused and tired walkers joined us at every station. There are many places along the line where there is no cell phone signal, so many of them had no idea why the trains had seemingly vanished. This last-minute detour was worth it. In 2002, my Settle-Carlisle journey was in fog and rain. In 2013, rain and snow. Earlier in the week, I had been buffeted and rained on at Ribblehead. Today, I was looking out at hills, valleys, lambs and sunshine. With the greyness gone, the fields and hills came alive in an incredible pallet of colours, hues and shadows - magical. Across the table from me, two walkers were talking about how different the world looked from a train compared to driving. Obviously, they weren't used to rail travel, but I am always glad to hear that people are rediscovering the joy of travelling by train. Earlier in my day, a young family on the Carlisle-Parton journey had marvelled at how much quicker the train was. While they insisted on calling their baby son (on his first rail journey no less) Mr Pudgy-Wudgy, they were sensible enough to see the benefit of rail travel. At last, my train reached Leeds, where I waited for the next train back to York. Across the track, the Saturday night crowd heading for Sheffield were joined by at least six BTP officers and a contingent of private security guards. My train to York was surprisingly quiet and I arrived back in York 30 minutes earlier than I had planned on my itinerary, despite having taken a longer route home. I was glad of the changes I had made, not just because I had experienced the Settle-Carlisle in sunshine, but because upon arrival at York, I was met by the people bound for Newcastle. They were enthusiastic to say the least. In fact, they were so eager to get on the train, that they pushed me back onto it as they tried to climb aboard before I had been able to get off. Had I travelled via Newcastle, I might have had hours of them. My week of rail madness was at an end as I hung up my rover ticket. I had gained hundreds of photos (some of which appear here), a better understanding of the British rail network and, perhaps more importantly, a broader knowledge of the north of England. Despite the media stereotype of the misery of the north, it isn't all bad news. I had uncovered many beautiful railway journeys and some nice towns. Sometimes the story just needs a little more digging to reveal the nuance that makes travel so interesting.